Last weekend we had a very packed schedule- so packed in fact that I could not even go to parkrun! We were off on Saturday morning to get the tube, as first up we had tickets for a little Star Wars exhibition inside Harrods (no prizes for guessing who booked that). 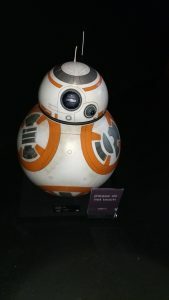 Harrods was a total nightmare- so busy, no signs (could not even find the stairs at first) but the exhibition was pretty cool (although very tiny)- it had all sorts of props from the latest films, and items for sale if you had many thousands of pounds. We then got some lunch and went to eat it in the park- all lovely until a man sat on the bench next to me, took off his shoes (yes… no idea why he thought this was acceptable behaviour) and then started smoking. At least we had finished eating so we had a bit more of a walk. 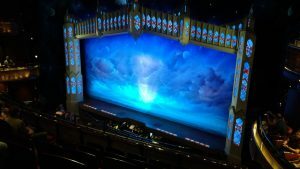 Then we went to pick up our tickets for Book Of Mormon- I had got these for Andy for his birthday as he wanted to see it again. It was very funny, although the people next to us did not seem to enjoy it- not sure what they were expecting. We had planned to go to Mildred’s for dinner (a veggie restaurant) but they don’t take bookings, and even though we got there fairly early, the wait was huge, so we walked for a bit before finding a Bill’s for a nice dinner before getting the train home. The underground was so hot, and it did make me very glad that I don’t have to get the train for commuting. On Sunday we had a more leisurely start, so I went to our track session, and my auntie popped by before we headed out to the train station again. 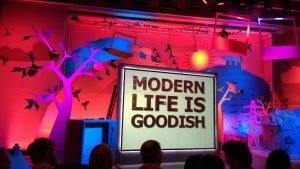 We had tickets to see Modern Life is Goodish (by Dave Gorman)- last year we had them but didn’t get in (they give out free tickets, so they always give our more than they have, and you just hope you are far up enough in the queue to get in). We left a lot of time as we didn’t know how long it would take- in the end it took about 90 minutes and we got there at around 3pm, even though doors didn’t open until 5, and at first we thought we were very early, but after a few minutes a queue started to form- we ended up being numbers 79 and 80. We were let in, given tickets for some free drinks, and then had to hang around for about an hour before they led us into the studio. We ended up seeing two shows being recorded- we watched one, had a short break and then had to sit somewhere else. The shows were very funny, but we didn’t leave until 9pm! We found a Sainsbury’s still open and bought a sandwich each to eat on the tube. It was a good weekend, but busy, and we were both glad that we didn’t have to get any trains or tubes on Monday! Do you like going in to London? Do you like seeing shows, and if so, which one is your favourite?